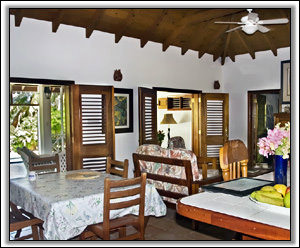 If you think Nevis sounds like paradise, you'll definitely agree when you enter Coral Reef Villa! 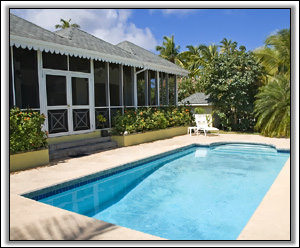 Built in the traditional Caribbean style, the delightfully appointed Coral Reef, at Nisbet beach, is the newest and best- equipped villa in the area. 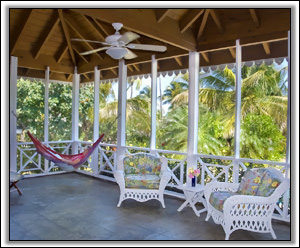 It is trimmed in solid mahogany with vaulted paneled ceilings, where every view is breathtaking-----the azure sea, verdant Nevis Peak, dazzling flowers and bushes wherever you look. 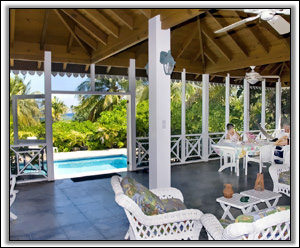 From the spacious screened-in verandah you'll have an unobstructed view of the ocean and its accessible coral reef while dining or relaxing on cushioned chaises lounges or in comfortable wicker chairs. Outside, two hammocks strung between palm trees provide a restful shady place to read or snooze, close to the 12 x 30 foot freshwater pool - purified with a conditioning system that uses very little chlorine. The large modern kitchen is fully equipped including dishwasher, gas stove, self cleaning oven, microwave, large refrigerator-freezer with ice maker, toaster, blender----all you'll need to cook a gourmet meal should you decide to eat in. The laundry room has a Maytag washer and dryer. However, a daily maid service is provided so you can just relax. 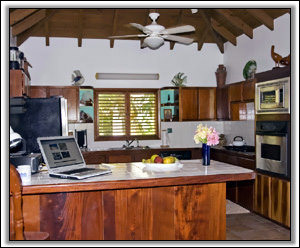 Coral Reef Villa includes cable TV, VCR, DVD, CD stereo-radio, and a state of the art generator. All bedding and towels are provided. And when the day is done, you can sleep in the villa's two large bedrooms, each with its own bath. 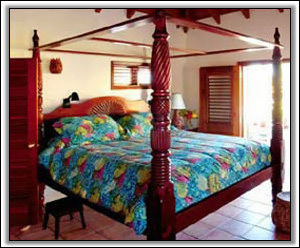 Both have exquisitely handmade Nevisian mahogany beds; one a king-size four-poster, the other twin beds which can be converted into a king-size bed. The bedrooms are privately located at either end of the villa and through mahogany double doors, both bedrooms enjoy the same fantastic view of the ocean, gently swaying palm trees, and evening stars. 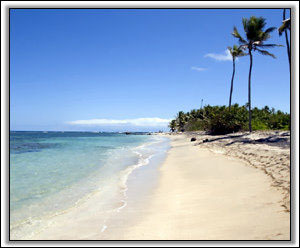 Coral reef is also close to great restaurants, water sports, and Nisbet Beach. 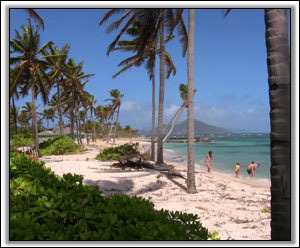 New Service - We will meet and transport you from either the airport on St. Kitts or Nevis to Coral Reef Villa....FREE of charge! Due to SPAM filters, to ensure delivery, please DO NOT change email subject.